Western blot analysis of extracts from various cell lines using MAGE-A3 (E9S4X) Rabbit mAb (upper) and β-Actin (D6A8) Rabbit mAb #8457 (lower). As expected, MAGE-A3 protein is not detected in HCC1143 cells. 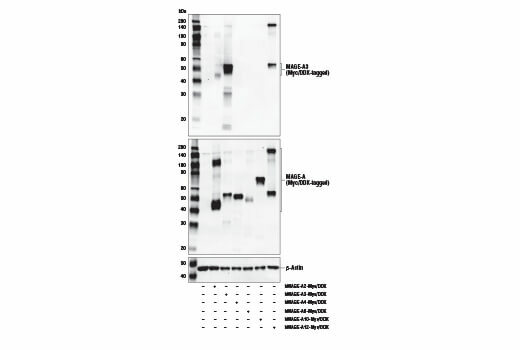 Western blot anlysis of extracts from 293T cells, mock transfected (-) or transfected (+) with constructs expressing Myc/DDK-tagged full-length human MAGE-A2 (hMAGE-A2-Myc/DDK), Myc/DDK-tagged full-length human MAGE-A3 (hMAGE-A3-Myc/DDK), Myc/DDK-tagged full-length human MAGE-A4 (hMAGE-A4-Myc/DDK), Myc/DDK-tagged full-length human MAGE-A6 (hMAGE-A6-Myc/DDK), Myc/DDK-tagged full-length human MAGE-A10 (hMAGE-A10-Myc/DDK), and Myc/DDK-tagged full-length human MAGE-A12 (hMAGE-A12-Myc/DDK), using MAGE-A3 (E9S4X) Rabbit mAb (upper), DYKDDDK Tag Antibody #2368 (middle), and β-Actin (D6A8) Rabbit mAb #8457 (lower). Immunoprecipitation of MAGE-A3 from SK-MEL-28 cell extracts. Lane 1 is 10% input, lane 2 is Rabbit (DA1E) mAb IgG XP® Isotype Control #3900, and lane 3 is MAGE-A3 (E9S4X) Rabbit mAb. 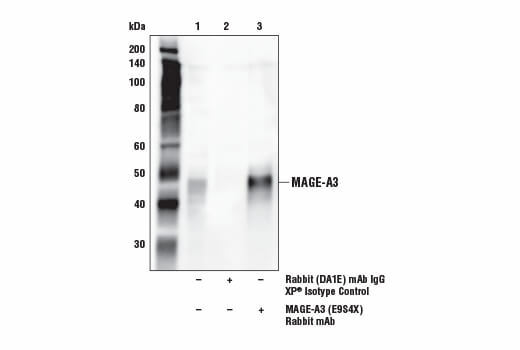 Western blot analysis was performed using MAGE-A3 (E9S4X) Rabbit mAb. Mouse Anti-Rabbit IgG (Conformation Specific) (L27A9) mAb (HRP Conjugate) #5127 was used for detection to avoid cross-reactivity with IgG. 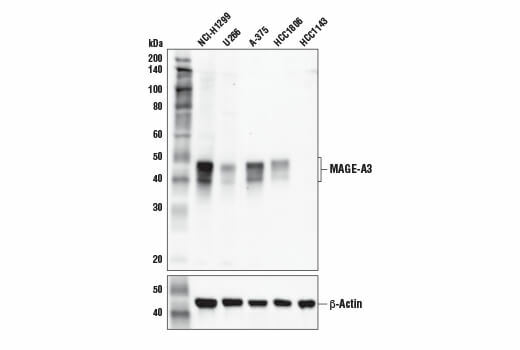 MAGE-A3 (E9S4X) Rabbit mAb recognizes endogenous levels of total MAGE-A3 protein. This antibody cross-reacts with MAGE-A2 and MAGE-A12 proteins. Monoclonal antibody is produced by immunizing animals with a synthetic peptide corresponding to residues near the carboxy terminus of human MAGE-A3 protein. Melanoma antigen-A3 (MAGE-A3) is a cancer testis antigen and belongs to the type I MAGE family of proteins. The expression of MAGE-A3 is normally restricted to the human testis but is aberrantly upregulated in a number of human cancers, such as lung cancer, colorectal cancer, and multiple myeloma (4-6). Research studies have recently demonstrated that MAGE-A3 drives tumorigenesis as part of the MAGE-A3-TRIM28 ubiquitin ligase complex that promotes proteasomal degradation of the tumor suppressor kinase AMPK (7). Due to its upregulated and selective expression in human tumors and high degree of immunogenicity, MAGE-A3 has received significant attention as a novel immunotherapy target through the use of vaccines and adoptive cell therapy (8,9). Jang, S.J. et al. (2001) Cancer Res 61, 7959-63. Shantha Kumara, H.M. et al. (2012) Cancer Immun 12, 16. Atanackovic, D. et al. (2007) Blood 109, 1103-12. Pineda, C.T. et al. (2015) Cell 160, 715-28. Straetemans, T. et al. (2012) Clin Dev Immunol 2012, 586314. Esfandiary, A. and Ghafouri-Fard, S. (2015) Immunotherapy 7, 683-704.